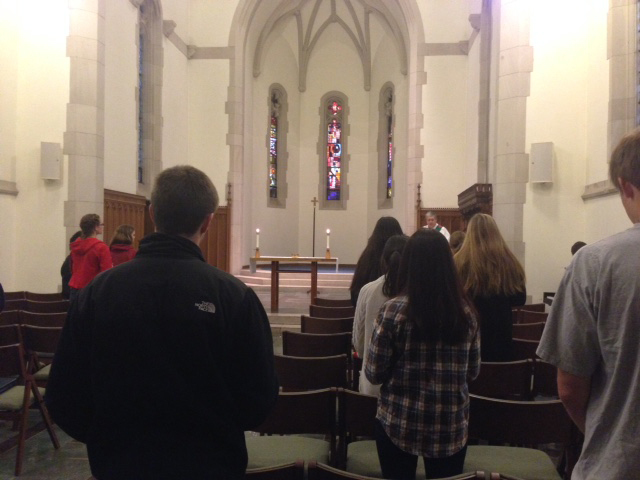 The Cornell Catholic Community worships during their Wednesday night mass Oct. 29. Francis declared that evolution and the Big Bang are real while speaking at the Pontifical Academy of Sciences at The Vatican, going against his predecessor, Benedict XVI’s beliefs on creationism. Francis explained that the two methods of thought are not incompatible but in fact “require” each other. Ithaca Catholic Deacon Mike Mangione said he was not shocked by Francis’ comments because of the way Christians are supposed to interpret the writings in the Old Testament. The Catholic Church has long been considered an anti-science institution, a troublesome relationship that started in 1663, when Galileo Galilei was suspected of heresy by the Inquisition after his statements about heliocentrism. Dr. William Hamant of Desales University’s Department of Philosophy and Theology said he believes the general public feels science and religion are at odds with each other, but that’s not necessarily true. Cornell Catholic community parishioner Rebecca Baldwin said she has always struggled with the theories of evolution and creationism because of her studies in the field of science. Mangione has been teaching the creation story as an evolutionary process that was begun by God and has come forward to where humankind is at today. He said he has held these beliefs since he did a high school research paper on the topic nearly 50 years ago. The biblical literalist movement is relatively new, only about 200 years old, according to Carla Marceau, a St. Catherine’s of Siena Parish parishioner and student of theology. Marceau said this group has different beliefs than others in the Catholic Church. Follow this link to see an interactive graphic of the Pope’s quotes.